The steep Snow Creek Trail features expansive views as it takes you from the bottom of Tenaya Canyon into the wonderful forests high above the valley floor. Follow the closed road over the stone, Tenaya Creek bridge. The road parallels the creek up to Mirror Lake (see Mirror Lake). After passing Mirror Lake, you’ll travel through a mix of forest and boulder fields with wonderful views looking up at the imposing, granite face of Half Dome. The trail travels through trees to the junction with the Snow Creek Trail. The steep trail switchbacks over 100 times up from the valley floor. The shade of the oak forests in the lower elevations gives way to unrelenting sun as you climb up. 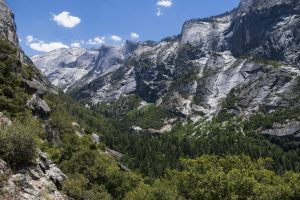 In exchange for the lack of shade, you have sweeping views of the east wall of Tenaya Canyon made up of iconic peaks such as Clouds Rest and Half Dome. As the trail approaches the top of the rim, it heads into the oak forests once more, gradually leveling off into a forest of fir and pine. At the junction, stay right to drop down to the footbridge over Snow Creek which serves as a great turnaround spot. For variety, complete the Mirror Lake Loop on the way back adding a mere 0.5mi/0.7km to your day (see Mirror Lake Loop).